(UPDATE: Use Coupon Code TWITTER1 to become a Julep Maven for a penny, and get this color with your Introductory 'Classic with a Twist' kit). How To: For this manicure I used one coat of Essie's First Base Coat for adhesion; two coats of Julep Claire; and one coat of Seche Vite Dry Fast Top Coat. Notes: Application of Claire was perfect - not streaky at all. The color was entirely opaque after two coats. I wore Claire for 6 days before removal; during that time I experienced no chips. The manicure remained gorgeous from Day 1 through Day 6. Accessories: Forever 21 Pearlescent Love Ring Set in Silver / Clear. What nail color are you rocking for #ManicureMonday? Follow me on Instagram @cafefashionista to see more of my favorite nail colors / art. What a gorgeous nail color! Love your rings. I'm wearing pink satin in xtreme wear by Sally Hansen. Love this blue. Great pics. Lov'n Megalast's Club Havana at the moment from WetnWild. Wow - six days with that gorgeous color is incredible! I find that polish tends to chip on me after just a couple of days. I have to try this brand. Looks really great. Sweet Monday post! Love this shade of blue! 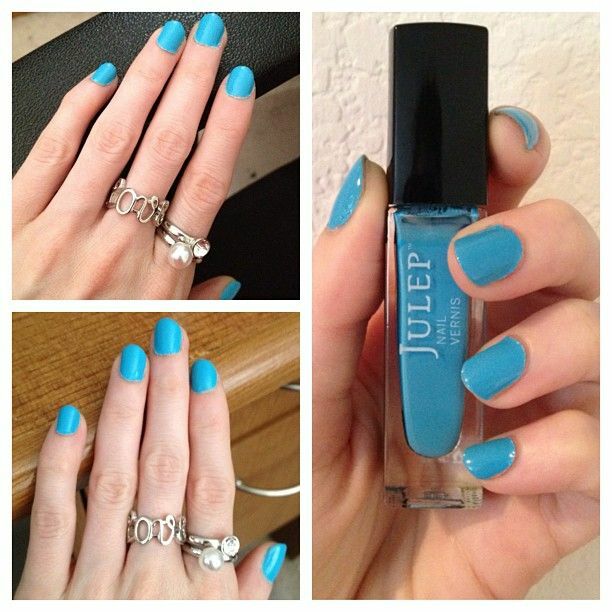 Definitely a summer blue nail polish..must have! That is such a pretty color! I want it! i love the color! oh and i love your rings! great color! I haven't tried this color... yet! will try it! hope you're having a fabulous day, darling! You wore is SIX DAYS? Holy man, that's long lasting! Oh beautiful! I have a polish very similar to that color....so gorgeous! NO way! That sounds so awesome and I love the color and I adore the bottle shape. You've sold me! That color is amazing. I don't wear nail color that much anymore, but I think I will over the weekends. Oh I love this color!! This is a very similar color to the blue I am wearing on my toes right now. I totally love the color and that F21 love ring. Too cute! Super pretty blue Erika! I am wearing Naked at the Beach and am considering if I want to repeat or switch to Floating Lotus, which is more of a carnation pink which I'm going to have put on my toes. That blue is an incredible colour. I'm inspired to add a fun colour to my nails. Love that blue! Right now I am wearing Julep's Charlotte. Whoa, I love that shade of blue! Not too intense, and not too light. If I ever get the shellac off my nails, I want to make them hot pink! you gave me an idea for this nail color next purchase :) thanks for sharing! What a great colour, not a colour I would usually go for but think I may give it a try! sooo lovely. 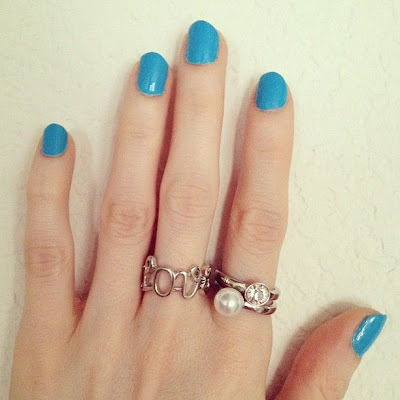 The blue is so pretty and as always- I adore your accompanied rings! Make the Guy in Your Life a G Star! Bean Bag Chairs 2.0 - You Know You Want One! Endless Style Bar Event - Chicago! Savvy Summer Style with mark! Summertime Style for the Cute Boy in Your Life!